Held Sunday 25 November 2018 2pm. All financial members are asked to attend, if unable to attend proxy forms and nomination forms are attached. Also any interested parties who wish to sit it, but have no voting rights. 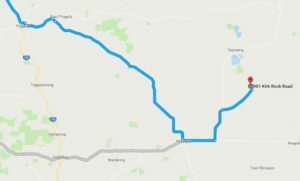 Approximately 2:45 hour south of Perth, to Greenbushes from Perth. 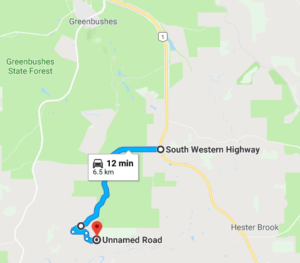 As shown on the Map below travel via Southwest Highway turn right at Forest Park Ave travel about 2.2kms and turn left on to Daniels Rd approx 3.1kms you will need to do a left u turn and travel down a hill. 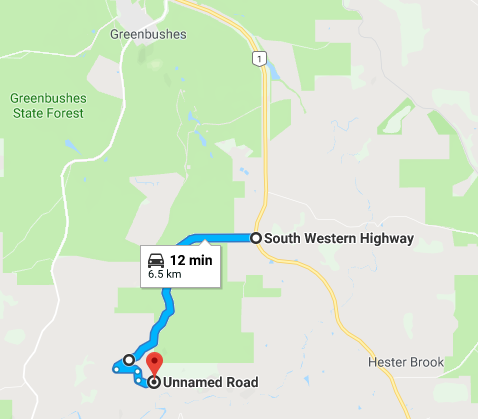 The major turn off at the highway and on to Daniels Rd should be sign posted if not look for the club arrows after you turn off from the highway. This is a fun weekend of ride what you want. Saturday your master of ceremonies is Aaron Barclay who will be arranging a few activities. The Loop will open about 1pm. Possibility of a return to Crash test dummy hill late in the afternoon. There will be a BBQ put on by the club, with the club supplying some steak and snags and a few cleansing ales plus cool drinks. There will be a presentation of club trophies in the evening followed by a reflective evening around the camp fire, bring a guitar or any musical instrument if you can play one, might have a sing song. Saturday: The loop will be open from 1.00pm, last rider out at 4.30pm. All riders musted be signed out and in, to ensure all riders are accounted for. Sign on from 12.00pm Saturday and 8am Sunday. You can sign on any time after the aforementioned times. All bikes will be scrutineered for safety. Riders must wear correct safety gear. Riders brief at 1pm(Sat) and 8.45am(Sun), safety brief to be given to all riders who turn up at other times. Ride what you want including moderns. As this is a non-competitive ride, you can arrive at any time after the start time and sign on, be briefed and have your bike scrutineered prior to entering the loop. All riders taking part in this event must be members of VinduroWA, paid the entry fee, be holder of a current MA licence or take out a one event licence. Club Members: $10.00(adult) $5.00 (juniors) plus non-competitive licence ($30.00) if required. 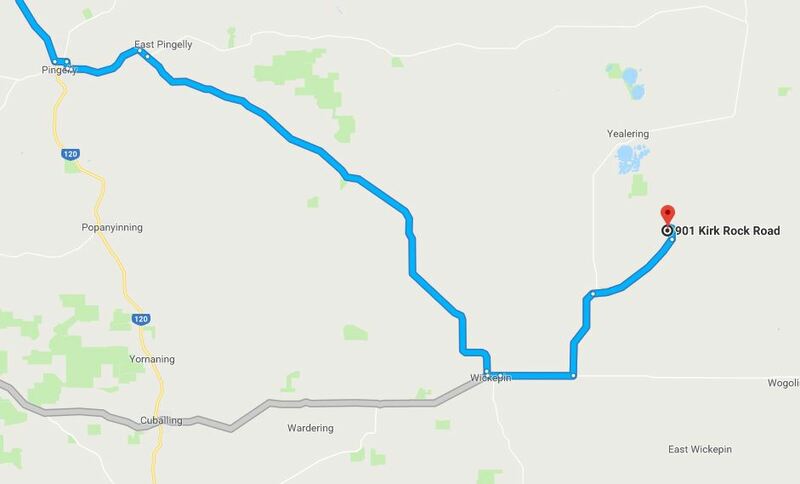 From Wickepin follow the Wickepin Corrigin Rd 8km turn right onto Kirk Rock Rd, 9kms turn left into the property. Should Have signs out. Please ensure that when you leave your area it is clean, please respect Whippy Dawes property. The only people allowed on the loop before 1.30pm(Sat) are the designated track markers and officials. Sign on from 12.00am Saturday and 8am Sunday. All bikes will be scrutineered for safety. Riders must wear correct safety gear. Riders brief at 12.00pm(Sat) and 8am(Sun). All bikes must be pre1995, the only modern bikes that will be used by designated personnel for safety reasons only and juniors (under 16yrs). We do not wish to offend by having to tell someone their bike is ineligible. Please check if you have any doubts. You can ride Saturday or Sunday or both days, it is your decision, for the one price. Saturday: The loop will be open from 13.30pm, last rider out at 4.30pm. All riders musted be signed out and in, to ensure all riders are accounted for. Please bring a sense of humour, this is supposed to be fun. This is your club, please make any criticism constructive. Have a great weekend! Error: Error validating access token: Session has expired on Friday, 10-Aug-18 03:56:17 PDT. The current time is Friday, 19-Apr-19 10:15:09 PDT.